No matter what training they may have had, all artists are ‘self taught’ to a certain extent. Progress is only made through constant study and practice. There are arguments for and against a formal training in art. Some say that it can stunt the individual expression of the budding artist. Many never progress beyond the boundaries of technique and the safety of general approval. Others say that having a good grounding in basic skills can only help an artist to grow in any desired direction. It can be difficult to break free from the do’s and don’ts, with or without a formal education. I studied Illustration for three years at college. The standard of drawing we were expected to produce was extremely high. I had always had a gift, so I really enjoyed honing my skills. When I left college I knew that I could realistically represent any subject. I didn’t want to be an illustrator though. I don’t like doing what I’m told. Years later, when my children were at school and I had more time to myself, I found it very hard to draw with my previous confidence. I also wanted to express myself more, but had no idea how to do that. I began a journey of discovery, learning to use watercolour and acrylics and then moving into three- dimensional works as well. My solid foundation still serves me well. As my work has become looser and more expressive, the framework of tone, composition, design and good solid drawing supports me. It is a springboard into any other path I wish to follow, from anatomical studies to abstracts. I often begin a new subject by making detailed studies. In the prehistoric temples, for example, I often record every tiny hole, groove and mark in the stone very precisely. I may then do several black and white tonal studies, recording light and shadows. From there I will go on to watercolour, still working on site. I absorb feelings, impressions and anything else which seems relevant. Back in my studio a painting usually needs to ‘rest’. I hang it on the wall to ‘cook’. There is a way, hard to explain, of seeing a painting without looking directly at it. It’s a corner-of-the-eye thing, a creeping-up-on-it, a catching it by surprise. I look at it in the mirror, I turn it upside down. It may only need a little ‘pulling together’, working into the shadows or perhaps into the details. Sometimes a painting will need much more work than this – maybe hours of retouching or complete reworking. From this I am sometimes led to semi or purely abstract works, occasionally going into 3 dimensional works in mixed media. I know that my solid grounding in drawing gives me a basis to work from and a confidence in my approach. 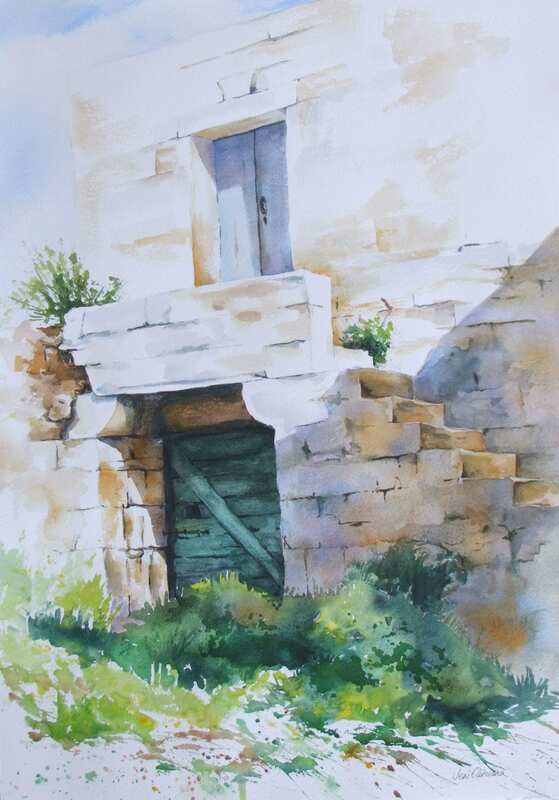 I have been teaching drawing skills and watercolour techniques in Malta for years now. I find that giving people enough basic knowledge and encouragement helps them to discover their own unique talent. I think those who approach art through abstraction and trying to ‘express themselves’ are impoverished as far as their potential is concerned. They often give up in frustration and follow another creative path. This is a shame, as learning to ‘see’ by learning how to draw can enrich all creativity on every level. Being able to capture reality accurately gives us a basis to extract from, and also a mine of information to expand on and explore. Please visit my other websites too….. I know I have a gift. It was given to me by my Dad. But there are structural things to learn, like how the first sentence is very important, not to start two paragraphs with the same word, etc. The great thing about writing, like drawing, is that there’s something new to do & discover every day, & a whole world to discover it in!